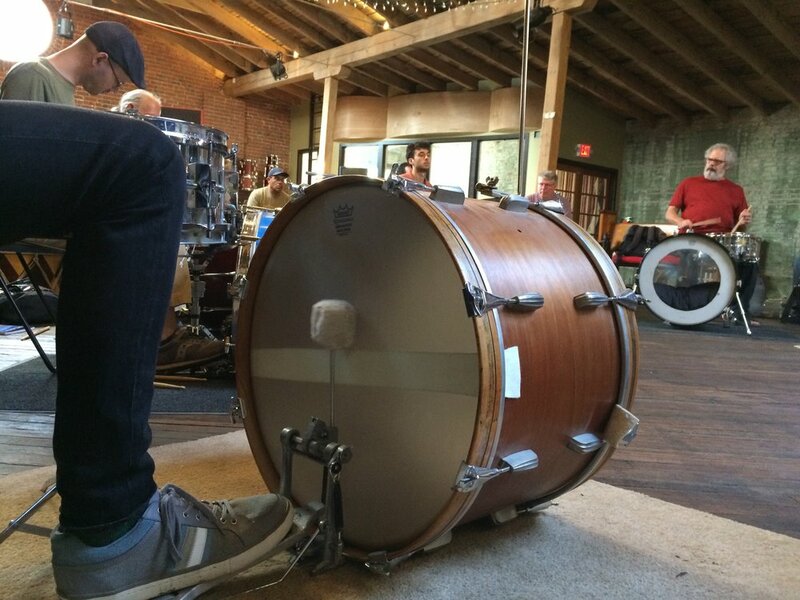 Rhythm Retreat at Brazil Barn is produced by Scott Kettner and Anita Jacobs Arts. 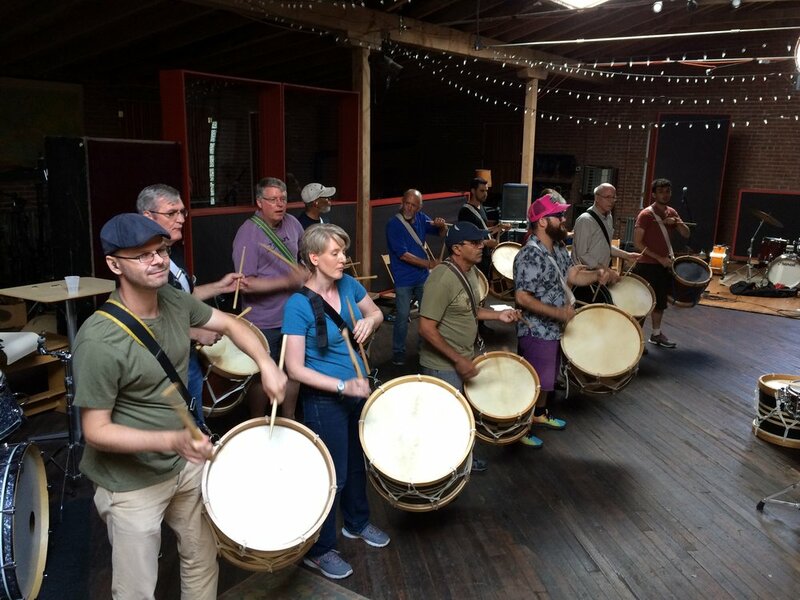 Directed by master drummer and percussionist Scott Kettner, this three day retreat is an immersive experience into the music and culture of Northeastern Brazil and beyond. The weekend combines a robust schedule of intensive percussion workshops, blowout dance parties, inspiring presentations, musical excursions and family activities. Our home base will be a large historic barn and the surrounding grounds of Tinicum Park in Bucks County, Pennsylvania, just steps from the Delaware River, and about 1.5 hours from NYC and Philadelphia. Home-cooked meals each day will include fresh herbs, local garden produce, and a selection of fresh baked goodies. 2019’s featured retreat guests include Brazilian music expert DJ Greg Caz, folklorist Ana Cristina Coura, members of Maracatu NY, and others TBA. 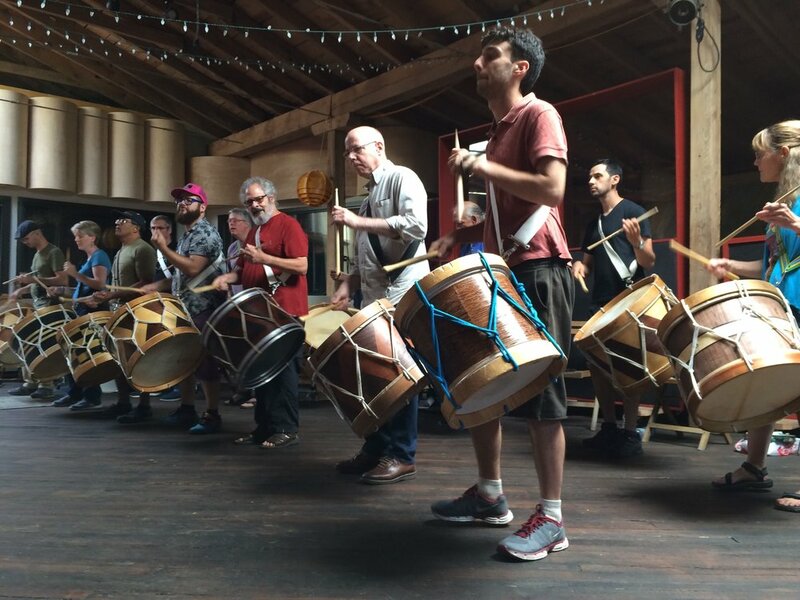 Whether you’re an instrumentalists seeking to improve your understanding of Brazilian rhythms, a drummer looking to expand your rhythmic vocabulary, or a seasoned percussionist eager to improve your skills, this retreat will challenge all levels. The weekend will culminate in a public performance and parade where you can show off your new drumming chops. Bring your friends and family and prepare to meet other Brazilian music lovers as we share a few days of glorious summer fun together. Sign up to receive updates and discount coupons. Pandeiro Classes for all levels. Photo by Matthew Hamilton. Explore hybrid drum set grooves, techniques and rudiments with Scott Kettner. Grab your orientation package and join us for a relaxed summer picnic and orientation session in beautiful Tinicum Park. Frisbee optional. Kids 3 years old and over can join us for an afternoon of supervised crafting workshops, playground adventures, and storytime in Tinicum Park. 4:00-6:00 Expedition to “Ringing Rocks” (all ages). Bring your hammer and sneakers and prepare to scramble over this unique boulder field in search of sonorous rocks. These musical stones resonate like a bell when hit with a hammer, and each has a different tone. We will select our favorite rocks and create our own Maracatu Rock Orchestra. Join us for a special welcome celebration at the nearby Tinicum Herb Barn (transportation provided). We begin with cocktails, croquet, and fresh herb sampling in the garden. A candlelit Feijoada dinner in the barn will follow. The feast promises to include fresh herbs and produce from the garden and homemade ice cream. All that drumming got you hungry? Join us for a delicious group picnic in Tinicum Park, finishing up with iced herbal tea, coffee, and Anita’s famous rosemary-apricot bars. When your done, feel free to stroll along the Delaware Canal, shop in nearby Frenchtown, or just lounge in a hammock under the trees. The renowned DJ and Brazilian music aficionado will break out the tunes and guide us on a musical trip around Brazil. Caz will chat about his extensive travels, demonstrate examples of regional dance rhythms, and share some of his favorite Brazilian recordings, from contemporary to old school. Scott Kettner will break out his famous Brazilian BBQ rub for a smokey feast to remember, including local roast corn, Brazilian potato salad, and homemade fruit pies. Cash bar for wine, beer and sangria. Break out a disc and enjoy a quick game in Tinicum Park’s woodland frisbee golf course, or just chill. Break out your dancing shoes and be prepared to hit the dancefloor with a special booty-shaking barn party featuring DJ Greg Caz’s legendary vintage Brazilian beats. Legendary drummer and percussionist Scott Kettner begins the day with this special class for Brazilian music lovers. 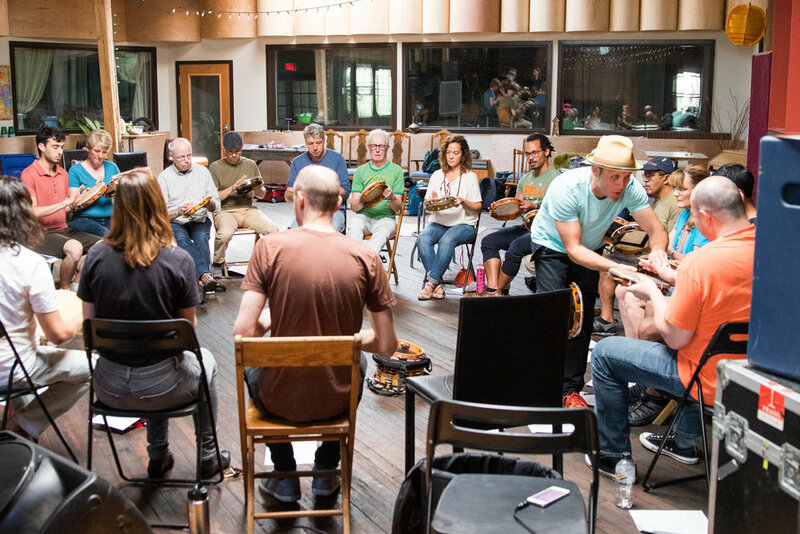 The session is particularly designed for teachers, camp leaders, and other folks interested in tips on how to lead a vibrant community percussion group. Join us for a group picnic lunch in Tinicum Park and enjoy a selection of finger sandwiches, herbal specialities and garden- inspired treats. Grab your drums and join Scott Kettner in a brief warmup to get ready for the day’s public performances. Performing with colorful puppets, and featuring Portuguese songs and rhythms, Storyteller Ana Cristina Coura brings traditional Brazilian stories to life in an interactive workshop for kids and families. 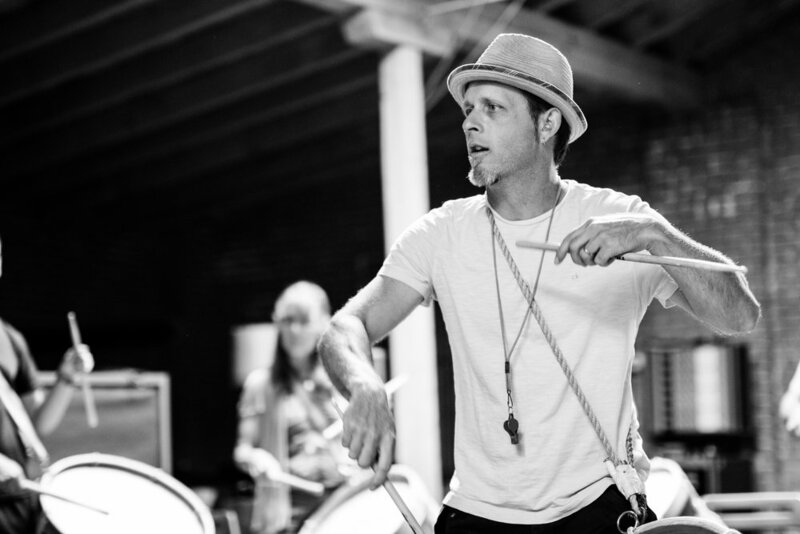 Master drummer and percussionist Scott Kettner uses drums and shakers to teach visitors an introduction to maracatu, forró and other rhythms of Northeastern Brazil. Drums and egg shakers will be provided, but feel free to bring your own instruments too. It’s party time! Join us in a joyful and raucous procession around Tinicum Park celebrating the musical and dance traditions of Northeastern Brazil. Grab a giant puppet and join costumed dancers as we boogie around the grass with dozens of drummers and percussionists from the celebrated ensemble Maracatu NY. Shake a tail feather to the rhythms of Brazil as we blow the top off of Brazil Barn in a colorful dance celebration to remember. When Scott Kettner looks at a map, he sees a direct line that connects the rivers of northeastern Brazil to the parishes of New Orleans and the streets of NYC. A master percussionist, bandleader and educator, Kettner is the guiding force behind Nation Beat, a band whose teeming, vibrant rhythms find common ground in the primal maracatu rhythm of Brazil’s northeastern region, the Big Easy’s funky, hypnotic second-line and strolling Mardi Gras Indians, and the unfettered freedom of big-city downtown jazz. Anita Jacobs has been working in performing arts for over 20 years and is the founder and director of Anita Jacobs Arts, a new programming, consulting and production company based out of Brooklyn, New York. She served as artistic director and director of public programs at Brooklyn Botanic Garden from 2001-January of 2019 where she created and produced numerous site specific events and large-scale outdoor festivals including Sakura Matsuri, the Chile Pepper Festival, and Ghouls & Gourds. Previous work included Celebrate Brooklyn, The New York Jewish Film Festival, and over ten years as an award-winning public radio radio producer for music programs on NPR and PRI. Anita loves gardening, playing with dogs, and baking scrumptious goodies. Greg Casseus has been spinning around New York since the early 1990s. He made a name for himself during his long stint at Black Betty (R.I.P.) in Williamsburg, where he co-hosted Brazilian Beat Sundays – a raucous DJ night of 1970s Brazilian dance music that inspired two mix CDs, Baile Funk, Vols. 1 & 2. Caz caught the "sweet sickness” of record collecting at a young age and owns crates and crates of funk, soul, rare grooves, reggae, jazz, golden-era hip hop, Latin music, ’70s soft rock and African music. Aside from his residency at Nublu in the East Village, you can also catch him occasionally spinning at Bembe in Brooklyn. Dr. Michele Nascimento Kettner, a native from Brazil, has dedicated herself to teaching for more than 15 years. She has received her PhD in Hispanic and Luso-Brazilian Literatures from the CUNY Graduate Center. Her research interests include the topics of regionalism, globalization, transnationalism and migration. Parallel to her research on Latin-American Literature, Nascimento Kettner has co-authored a book on Afro-Brazilian music and culture, Maracatu for Drumset and Percussion, published in 2013. She currently teaches Portuguese and Spanish at New York University(NYU). All workshop activities and performances will be held at the Tinicum Barn (Brazil Barn) in Erwinna, PA. Early Bird Special April 16-May 13, 2019. CANCELLATION: All payments and deposits are refundable up to 7 days before event. Scott Kettner’s Rhythm Retreat and Anita Jacobs Arts reserves the right to take photos and/or video during. the retreat and to use such photos and/or video for advertising and marketing purposes. By registering for Rhythm Retreat 2019, you agree to release your photograph without compensation and understand that Scott Kettner’s Rhythm Retreat and Anita Jacobs Arts reserves all rights in regard to reproduction of said photograph. Rhythm Retreat welcomes all ages however most participants will be adults. Participants under 15 are permitted if accompanied by legal guardian/chaperone. Don't hesitate to reach out to us if you have any questions. Rhythm Retreat participants are responsible for their own accommodations, but we have provided a list of suggestions at different price points. Our home base is Brazil Barn (a.k.a Tinicum Barn) which is located in Tinicum Park in Erwinna, Pennsylvania. We are located very close to the cute Victorian hamlets of Frenchtown and Milford, New Jersey which have coffee shops, restaurants, and lodging. Located in Tinicum Park about a three minute walk from Brazil Barn, there are a group of nice wooded campsites with fire grills and restrooms. We have reserved a number of group sites for our guests at the rate of $4 a night per person. Contact us for reservations and more details. We have reserved several nearby Air B&B’s for our guests which are available on a first come first served basis for folks staying in the area both nights. Contact us directly for reservations and more details. Charming carriage house on very private 8 acres overlooking Walnut Pond. The long driveway takes you past our small vineyard, a log cabin built in 1789 and across Little Nishisakawick Creek. The carriage house is bright & cozy with lovely views & private patio great for nature watching. We live in the adjacent converted barn. 2 miles from historic Frenchtown on the Delaware River, close to Bucks County with a great variety of restaurants, miles of towpath & old river towns to explore. 200 year old 1400 sq. foot home with front porch, side yards, trees and bluffs in the backyard; the Delaware River is across the street with small views from the porch; short walk into the quaint river town of Milford where there is a micro-brewery/ restaurant, antique shops, and market; perfect for biking, walking, kayaking and tubing; an easy getaway from NYC or Philly. The home was an old stagecoach stop but has been completely updated and immaculately decorated with antiques. There are a number of nice Bed & Breakfasts in the immediate area. We recommend making reservations as early as possible. Cycle Corner in Frenchtown has bike rentals for the whole family. Their inventory includes tandem, youth and child carrier bicycles. Delaware River Tubing offers daily, adventures including tubing, rafting, canoeing and kayaking along the Delaware River. Transbridge Bus Lines goes directly to Frenchtown from Port Authority Bus Terminal in NYC in a little under two hours.